Biggest strength in 2016: Good teams stop the run well, and the Pioneers’ front seven stopped the run better than any other team in the NEC, allowing ony 3.2 yards per carry during the season. Additionally, in their six wins, Sacred Heart held the opposition under 20 points each time. With a defense like that, the 2015 Pioneers had a chance in every game they played. Biggest Challenge In 2016: Giving up more than 20 points spelled trouble for Nofri’s team last season – whenever they did give up that many points, frequently of the big play variety, they lost. An extremely winnable game versus Central Connecticut State, where they fell 26-10, really sticks out. Biggest Departures: Sacred Heart graduates their top three receivers, but their best, WR Tyler Dube, will be missed the most. The Southington, CT native averaged 16.3 yards per catch, notched 1,160 yards receiving last year, and caught 9 touchdowns. 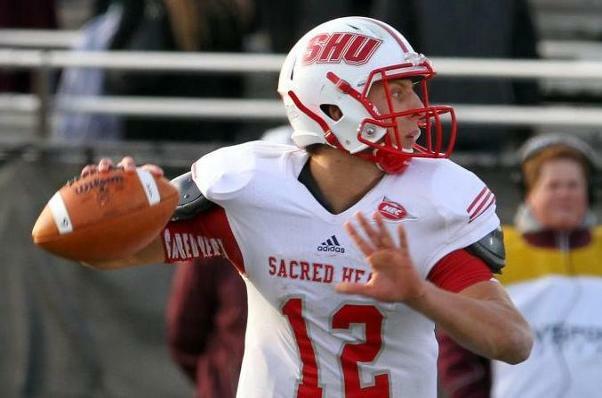 Players To Watch: Already, three-year starter QB R.J. Noel has rewritten Sacred Heart’s record books, with the schools first-ever NEC championship, FCS playoff appearances, and the winningest stretch in Pioneer football history. He’s a true dual-threat QB and had only had success in a red and white uniform. But this year he will be throwing to three different receivers than last year, including his go-to receiver in Dube. Can he finish with another championship season? Until his season was cut short by injury, LB James Rentz (53 tackles, 8 1/2 sacks) was having a monster year as a pass rusher for Sacred Heart. If he can stay healthy, his pressure from the outside will be critical in keeping the Pioneers’ defense atop the NEC. Biggest Game: vs. St. Francis (PA), 10/29/2016. In many ways, this game at DeGol field last season showed Sacred Heart team in a nutshell – playing stifling defense in the first half, holding onto a 7-3 lead, then giving up two big touchdown plays to help lead the Red Flash in a 23-14 final. With the Red Flash again expected to contend for the NEC championship, a Sacred Heart win at home could be critical for the Pioneers’ NEC title hopes. Sacred Heart In Two Sentences: A light early-season schedule could allow the Pioneers to really get things together by conference play in mid-October. It’s pretty easy to see a scenario where Nofri’s team comes together and gived Noel the third FCS playoff appearance of his playing career – if the rest of the team can pull it all together.